Back in the depths of winter, our good friends, Rocky and Jolyn, hosted us at their home a few hours south of where we live. Even though the ground was covered in mountains of snow, I felt like it was the middle of summer – for the simple reason that they served us this grilled pork tenderloin for dinner. Rocky took one for the team, braving the frigid cold to tend to the grill on the deck, but the result was well worth the biting chill (right, Rocky, right??). This tender, juicy pork tenderloin is marinated in a blend of citrus and soy, a little parsley and Worcestershire, and a few other seasonings thrown in. Grilled to perfection, it really is one of my favorite ways to eat pork tenderloin now and I’ve made it several times since, each time serving it to company who loved it as well. You can’t beat the simplicity of throwing a cut of meat into a quick marinade and slapping it on the grill for a delicious, easy dinner. Rocky and Jolyn served the pork with sweet potato fries and an easy and oh-so-delicious guacamole salad, which I’ll share later this week. Although the snow is gone (hallelujah! ), this grilled pork tenderloin is still a welcome dish and one that I’ll be making often through the true grilling season! Thanks, Rocky and Jolyn! Combine all the ingredients except the pork and mix well. Pour the marinade into a ziploc bag or baking dish and add the pork tenderloin, making sure the marinade completely covers the pork. Marinade for 8-10 hours. Preheat an outdoor grill (charcoal or gas). Grill the pork tenderloin about 3-4 minutes on each of its four sides (the exact time will depend on the temperature of your grill) or the internal temperature is about 150 to 155 degrees. Remove from the grill, tent with foil, and allow to rest 10 minutes before slicing and serving. Recipe Source: adapted slightly from Rocky and Jolyn B. who got the recipe from Elizabeth R.
I have two pork tenderloins (2 1/2 lbs. and 2 3/4 lbs) how long would you cook this in the oven? What temp? Maybe 25-30 minutes at 350 degrees? 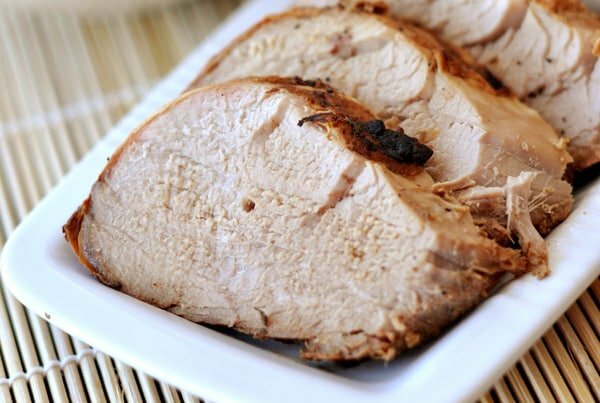 This is my favorite pork tenderloin recipe! It’s delicious and easy! This is AMAZING!! I have made it several times with great results. We are low on olive oil, though. Have you ever used vegetable or canola oil instead? No, but I think you could. This is our go to recipe! We love this recipe so much we served it at my daughter’s wedding. As always, good job Mel! Have you tried making the marinade into a dipping sauce. I have but it has been too powerful. Any ideas or suggestions? I haven’t, but I wonder if it would help to dilute it with broth? I’ll give it a try and let you know! Cut the oil unless you want a grill fire. 1/4 cup max! I made this for dinner tonight and the whole family loved it. I marinaded it for about 8 hours and it was very flavorful. I had to grill it since my husband was running late–and it’s been forever since I have grilled pork tenderloin–luckily your instructions were spot on. Thanks for another delicious recipe! I had somehow forgotten this recipe but made it last night (along with the amazing guacamole salad) and it was a home run! My family of seven devoured this meal and it was a perfect post-baseball game, busy spring night fresh and delicious meal. Thanks so much for all your wonderful recipes! I made this today except I used the oven instead of the grill….it was flavorful and absolutely outstanding! My husband and teen boys proclaimed it a keeper. Thanks for another fantastic recipe! This recipe is spot on for flavor and cooking temperature. The marinade was excellent and the instructions were precise. Thank you for an absolutely delicious entree. 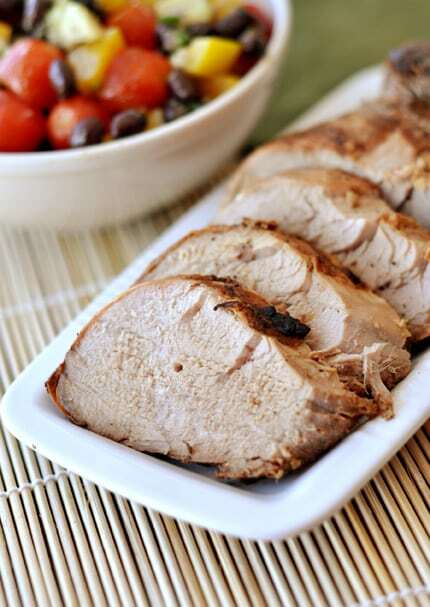 Just tried this recipe using pork loin chops and they were great! Gaynor – thanks for posting your comment here! The broil time really depends on the broil temp of your oven and the thickness of the meat. If broiling at around 450 degrees with an average sized pork tenderloin (maybe about 2-3 inches thick) I would suggest about 8-10 minutes per side. Keep a close eye on it – I don’t want you to end up with overcooked or raw pork! This was fantastic! We had it with your barley pilaf – which is a favorite at our house. I am about to grill this up for dinner tonight. It’s been marinating since this morning. Of course I’m just REALLY reading the directions now. I don’t see what temp I should set my grill for. Medium? Medium/high? Thanks. Renee – I usually grill this at about 350-400 degrees. I fired the grill up at breakfast this morning, grilled the pork, and re-heated for dinner tonight. It was very good! Glad I did it then — the rest of the day in the marinade would have probably made it too salty. Thanks for getting back to me! And thanks again and again for your site – you have reinvented cooking at my house! Katie – I’m not sure what you ended up doing but my inclination is to say the pork should probably be cooked within 24 hours but I really don’t know how it would fare for longer. Hope it worked out ok! Could they marinate for more like 34 hours? I prepped them this morning and then realized we have dinner plans tonight. Oops. I guess I could grill them tonight and eat them tomorrow, but I’d rather eat them fresh off the grill tomorrow. Help please! sounds so good! do you think it would work with a george foreman grill? Lacey – I don’t know since I’ve never cooked anything on a foreman grill but it’s worth a try! Just watch the cooking time. this sounds like a lovely pork preparation, although i’ll admit that i’m more than a little excited to read about this guacamole salad! I came to your website today looking for a recipe for a pork loin that’s sitting in my freezer. This sounds perfect, but mine is a lot bigger (4.25 lbs). Any idea how much longer this will take to cook? And since I have to thaw it in my fridge before cooking it, can I just marinate it while it thaws? Tiffany – you’ll have to watch the cooking time just to be sure (a lot depends on the thickness of the cut of meat). I’d suggest a minute extra on each side and then test. I think it’s a great idea to marinade it while it thaws. We made this for dinner tonight- It was GREAT! We had pineapple grilling on the bottom, and the pork slow cooking on the top, so there was just a hint of the pineapple in there. It was so yummy; we’ll definitely be making it again soon! Sounds good! I don’t have a grill, though. Have you ever tried it in a crock pot? Elizabeth – I’ve never tried it in a crockpot. I’d recommend broiling in the oven before trying the crockpot so you can get the delicious, nice crust on the outside. Awesome recipe, Mel! I’m always looking for new ways to jazz up my pork and this is so simple, quick and I bet absolutely delicious. Thanks! I did almost this exact same recipe yesterday on chicken. I didn’t put lemon juice or parsely, but everything else was the same. Marinated for about 4 hours and my family went wild! Yeah for easy marinades and weather perfect for grilling — no more hot kitchens!!! Grilling does shout summer, and I am glad we are able to grill again, this recipe looks terrific. 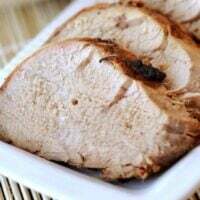 Love pork tenderloin! A citrus soy marinade sounds wonderful! This looks delicious, Melanie! I love pork tenderloin, and the salad in the photo also looks amazing! Yes, the internal temp is what it should be. I’m so glad you had a great experience.